1. National Tooth Fairy Day comes twice a year in the United States. Yep, that’s how much the Americans adore their tooth fairy — a mythical figure that rewards children for their fallen milk teeth with a little token payment. In fact, this little fairy is so nice, they even celebrate her twice! National Tooth Fairy Day occurs on 28 February and 22 August every year. Talk about #SquadGoals. 2. In Europe and Latin America, however, the tooth fairy becomes a mouse. The tooth fairy probably doesn’t enjoy international travel very much, so outside North America, she gets some help from a little mouse. Over in Italy, children look forward to visit by Topino; their friends in France and French-speaking Belgium have la Petite Souris; while in Mexico, Peru and Chile, it’s called Ratoncito Perez. Different names, same deal — cash-for-teeth. 3. They kissed a donkey, and they liked it? Well, word has it that during the Middle Ages (5th to 15th century) in Germany, when people had a toothache, they believed kissing a donkey would make it better. Erm, we recommend that you visit a dentist. 4. Love your toothbrush; it beats than sticking a twig in your mouth. Back in 4,000 BC, it is said that Hindus would look for a fresh twig, fray the end into fibres and use it to clean their teeth. Can’t blame early men for getting creative; the modern toothbrush as we know it (plastic handles and nylon bristles) was only invented in 1938. 5. You had teeth before you were born. 6. You’ll spend about 38.5 days of your life just brushing your teeth. If that seems like a lot of time to spend cleaning 32 teeth, think again. Your mouth is swimming with over 100,000,000 micro-creatures, some of which are feeding, reproducing and depositing waste! A good morning-and-night brush keeps them in check. 7. Tooth decay is actually classified as an infectious disease! Most of us don’t think of tooth decay as a disease, but it is! In fact, it can be classified as an infectious disease because it is caused by a particular strain of bacteria passed between multiple people. So, if you’ve heard people say that cavities are contagious, that’s why. 8. Tooth enamel is harder than steel. Your teeth are made of the hardest biological material there is. Tooth enamel is harder than steel but more brittle, so don’t think of them as invincible. And while they are strong, unlike your bones, they are incapable of self-repair. That’s why dental work like crowns and fillings are necessary to protect them when they are damaged. 9. The Japanese once thought white teeth were unattractive. The practice of ohaguro (blackened teeth, made possible by dyes) was ingrained in Japanese culture in the medieval times. It was regarded as a symbol of beauty, especially among aristocratic ladies, but was eventually outlawed in 1870 as the country sough to modernise itself. Three years later, the Empress of Japan appeared in public with a set of pearly whites, officially making white the new black. These days, all it takes is a single visit to the dentist to get a bright, sparkling smile. 10. 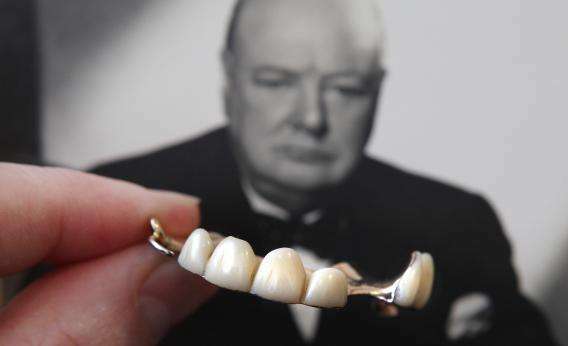 Someone paid US$24,000 to bring home Winston Churchill’s dentures. To be fair, these are known as the fake teeth that saved the world. The British wartime leader, known for his rousing speeches, had several sets of partial upper dentures specially made to hide his natural lisp and accentuate his signature slurred diction. If you need to hide the fact that you’re suffering from crooked teeth, the almost-invisible Invisalign may be your best bet. After all, your smile is your best asset. If you need help getting the smile that you want, we can help! Take this free online smile assessment and get our dentists to give you their professional opinion. PREVIOUSDental Crowns: Your New Crowning Glory?